The Oxford, located at 319-105 Fayetteville Street, is doubling down on Halloween weekend in Downtown Raleigh on Friday and Saturday. On Friday, The Oxford continues their six-year tradition of giving away $500 for the best group costume and are known for bringing out some of the most innovative costume designers. Registration begins at 9 p.m. and you must be present when they announce the winner at midnight. 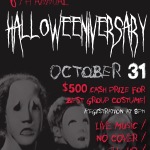 Get all the details at http://www.oxfordraleigh.com/2014/10/20/the-oxford-halloweeniversary/. 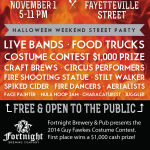 On Saturday, The Oxford shuts down Fayetteville street and lights up Downtown with fire performers, bands, and more. Check out all the details at http://guyfawkesraleigh.com/.